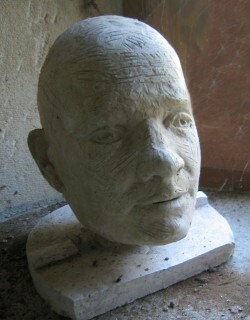 Bust commissioned by Renato Wilde. Jean Genet came to London with Wilde in January 1952 and sat for the bust at Henghes' Albert Bridge Studios. Initial sketches were made on the 20th and the plaster cast (shown here) was completed by the 25th Jan. A bronze cast would also have been made. Genet and Henghes knew each other over a number of years with most of their meetings being at Wildes villa Rospini in Rapallo. (See also article on pool at the villa Rospini).